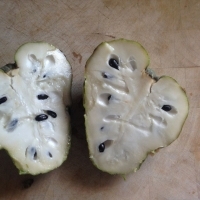 This fruit is almost identical to the custard apple in appearance and similar in taste. The flesh is juicier, sweet with a hint of pineapple. A probable Reticulata hybrid, Rosa produces exceptionally creamy, gigantic fruits which bear the fine flesh qualities of Cherimoya whilst also being larger than not only those of all other varieties in its class, but also that of sugar apples, including African Pride. Fruits are ovoid, heart shaped and have slightly reticulated skins. Thought to be of Spanish Origin. A prolific fruiting selection with white flesh that is sweet and rich with a smooth, custardy vanilla flavour. Has performed exceedingly well in Adelaide SA. Originating in Quito, Ecuador. 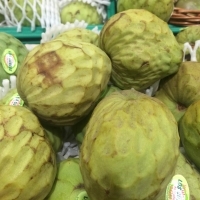 Cherimoya is and excellent shaped fruit with juicy, sweet flesh. When mature, black speckles may appear under skin. Matures mid-season. Spain's main commercial variety. 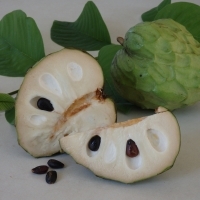 Similar to a custard apple, but more juicy with a hint of pineapple and more cold tolerant. Cherimoya fruits are regarded as one of the most delicious fruits known to mankind.